After the smash success of Batman: The Animated Series, the show’s creative team moved to an adaptation of DC’s other big hero with Superman: The Animated Series. 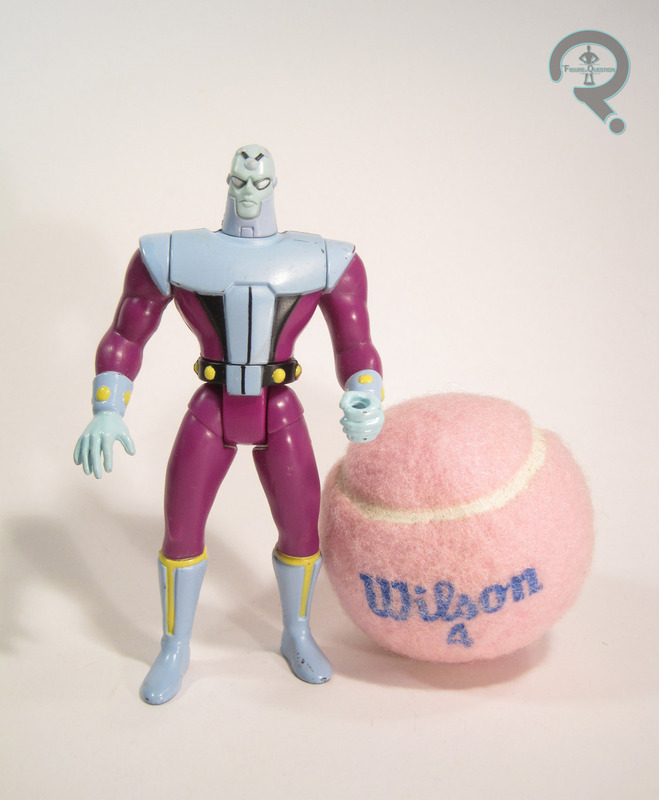 Though not quite the same cultural phenomenon as its predecessor, the show was still a pretty solid success in its own right, and unsurprisingly netted its own line of toys. But, while Kenner’s BTAS line actually covered a good chunk of the show’s cast, with the wacky-Bat-variants coming in later, Superman’s line was much more variant heavy from the very start. There were only two non-Superman figures in the initial launch: Superman’s two biggest foes, the previously reviewed Lex Luthor, and today’s focus, Brainiac! 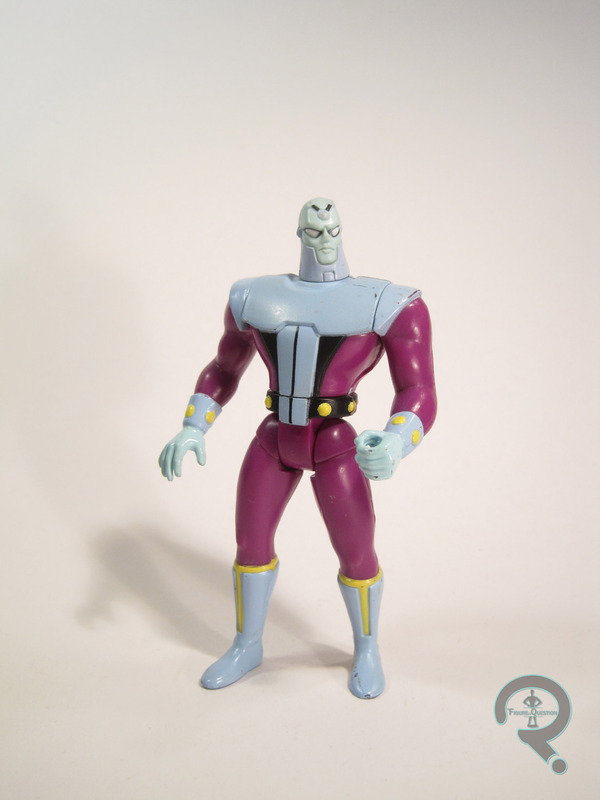 Brainiac was initially released in the first series of Superman: The Animated Series figures under the name of “Evil Alien Brainiac.” You know, in case there was some confusion about his motivation or his place of origin. Kind of sad we didn’t get this naming scheme across the whole assortment. Why not “Good Alien Superman” or “Evil Human Lex Luthor”? Would those have not appealed to the mass consumer as well? Regardless, the figure in this review is not actually the Series 1 release, but is instead from the “Battle for Metropolis” four pack released at the tail end of the line. The two figures are essentially the same, but there were some color differences, which I’ll touch on in the paint section. The figure stands 5 inches tall and he has 6 points of articulation, which was standard for the line. After being reasonably faithful to the show designs for BTAS, the STAS line was a bit more stylistically divergent from the show. Brainiac was one of the more faithful sculpts from the line, though he lacks the somewhat streamlined proportions of the show design. Beyond that, though, it’s not a bad offering. The details are pretty well defined, the costume details are all where they’re supposed to, and the pre-posing isn’t as crazy as some of the other figures in the line. The paintwork on Brainiac does the sculpt well and keeps him fairly faithful to the show. This second release was even closer, having swapped out the shade of purple for a slightly warmer tone like we saw in the show. Both versions of Brainiac were packed with the same missile-launching Space Sled. My figure is without said accessory, though. My STAS collection growing up was actually pretty small. Brainiac here was a slightly more recent addition (though still purchased almost a decade ago, so “recent” is relative), purchased from Yesterday’s Fun Toys & Games during one of my family vacations. He’s a solid figure of a solid design, and really one of the better figures in this line.